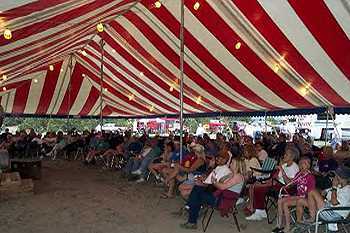 On Monday July 30th, at 8:30am, it was time to line-up at the staging area just east of the 'big top'. 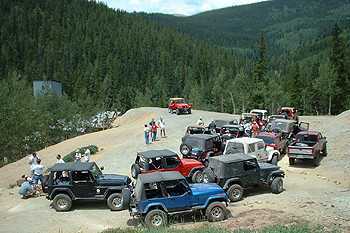 Geezzzz it's only Monday---no working, just jeepin'! Are you in staging line 2, on channel 35? 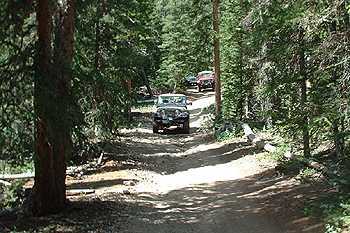 Then you were going to run the Toll Road Gulch/Clover Creek Trails just north of the old mining are of Bonanza (SW of Salida). 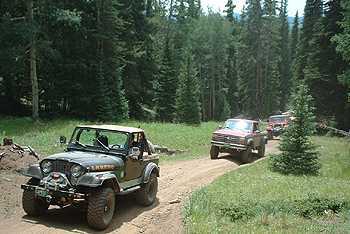 I (along with my jeepin-side kick Molly), led 20 rigs out of the staging area heading south on Hwy 285 to Poncha Springs. The 20 Jeepers for the day included: Lee Eslick (CJ5), Don Singleton-'Betsy' (CJ7), John Hacsel (CJ7), Robbie Martin (TJ), Pierce Mc Curry (TJ), Gill Rodgers (TJ), Larry Mc Clean (CJ), Tom Cross (TJ), Chris Potter with son Jason (CJ7), Rick Fitzimmons (Bronco), Bob Daniel (TJ), Fred Perry (TJ), Franklin Stucky (YJ), David Stucky (YJ), from Discount Tire: Steve Howland (YJ), Steve Rivera--pssst watch for his name---something about a 'tree' (XJ), and Eric Smoltz. My tailgunner was Drew Middleton (TJ), who had just lead the same trail the day before. 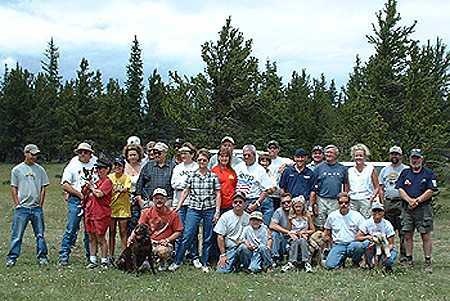 We headed south on 285 past Poncha Springs and about 5 miles south to Chaffee County road 200 along the Silver Creek valley. We aired down (for those who needed it) along the road, and stopped for restrooms at the FR 201 intersection. FR 201 was easy and a little dusty, but about 2 miles in, it slowed down and was time for 4WD. Following along Silver Creek, the trail wasn't technical, but was bumpy in spots. We passed Silver Creek Lakes, which is a series of nice homes with their own private lakes stocked with trout and some say Japanese Goldfish. Up about 2 miles was the turn off to FR 869.2 and Toll Gulch Road. The trail became smaller, and had more rocks to venture over. 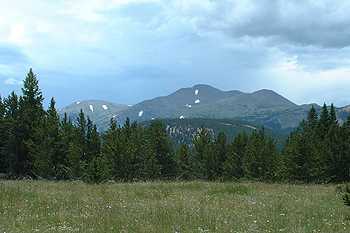 It climbed up and out of Toll Road Gulch, until we hit a treeless area with nice views to the north of the Collegiate Range. We had someone have a vapor lock, and someone else some electrical problems. But Fred Perry was there to help solve the mystery, and we were on our way! 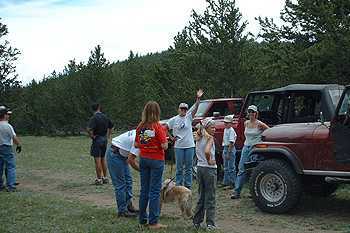 Climbing on thru Toll Road Gulch, we came across a ATV rider who was heading back down because he had taken a spill. Someone in our group was an EMT and they took care of his surficial wounds as best they could. He then headed on down with his Dad. 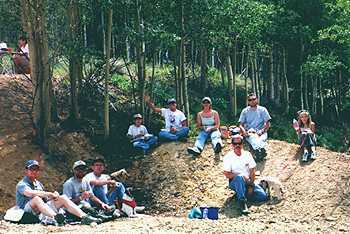 We reached the saddle and the high point of the trail, and headed on down for lunch near an old mine site. After lunch, I had researched a 'Jeep Trail' on a topo and a Forest Service map that showed it going up along the ridgeline. We headed up Bear Creek and I found the turnoff. Here is a link to Topozone.com and a topo map of the area with the trail clearly on it: http://topozone.com/map.asp?z=13&n=4245498&e=400304&s=25&size=m The trail was not any wider the an ATV trail, but it was the trail on the maps. Though upon traveling further up the trail, it became apparent the trees and the off-camber sections of 30 degree plus would get the best of me and our group. I opted to turn us all around back down to the turn off, and give up the 'adventure'. 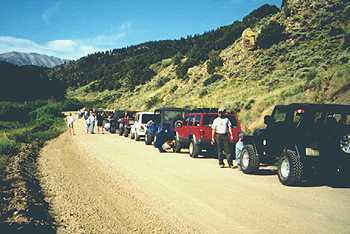 Now here's a great group of Jeepers!! 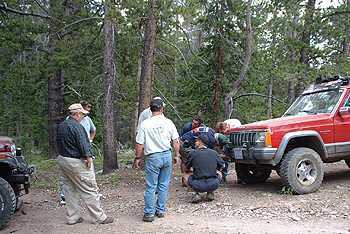 Down thru some switchbacks and some tight trees, seems one jumped out in the middle of the road at on XJ in our group. Steve Riveria's right front light and 1/4 panel were entangled in the tree. It had crunched the fender into the tire. I heard Steve had a $500 deductible for collision, how would you explain that? 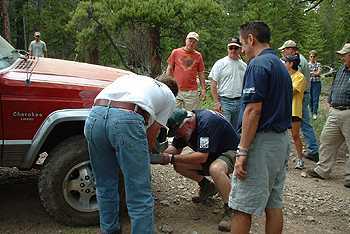 With some winching, we were able to free the tree from the XJ and proceed down Clover Creek. 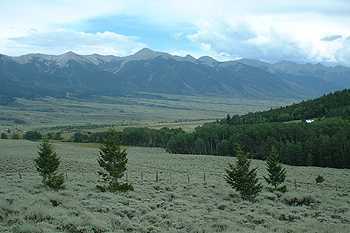 Once down in the open fields, one can look down SE and see the Sangre De Cristo mountains and the San Luis Valley. I took a poll on who wanted to try a new trail south of Salida, and we headed out to Salida to run it. The rest of the group split up heading back for gas or camp. 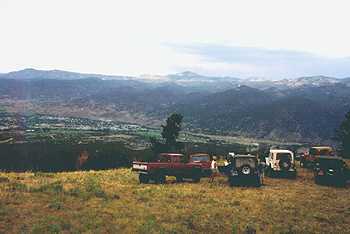 Bob Daniel, Fred Perry, Drew Middleton, Steve Howland (YJ), Steve "watch out for that tree" Rivera (XJ), Eric Smoltz, and I headed up FR 800 to check out the 4700+ elevation gain from Salida to the top of Methodist Mountain at 11,700'. Finding the turnoff, we headed up and up. The trail was easy at first then got more and more rockier. Well, as with most trails nowadays, we got more then halfway up and found a locked gate! Seems even though there is a radio tower on one of the two small mountain tops, they close the whole access to Methodist Mountain. 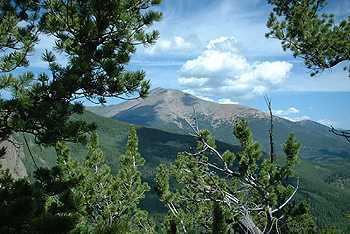 So, we did go up to an open area and par take of the views to the north up the Salida Valley. We then headed on down and back to camp. 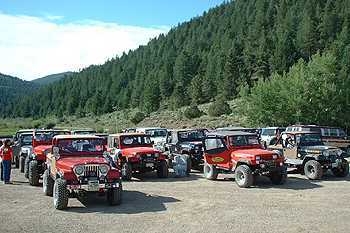 Thanks for a great day and good friends to jeep with! Sorry about our side adventure, but it surely was that an adventure!